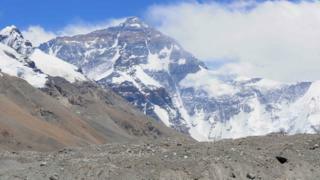 China has closed the base camp on its side of Mount Everest to visitors who don't have climbing permits. The Chinese base camp, located in Tibet, is popular as it is accessible by car - whereas the Nepalese camp can only be reached by a hike of almost two weeks. The world's highest peak has been struggling with escalating levels of rubbish for years, as the number of visitors rises. The Chinese Mountaineering Association says 40,000 visited its base camp in 2015, the most recent year with figures. A record 45,000 visited Nepal's base camp in 2016-7 according to Nepal's Ministry of Forests and Soil Conservation. Ordinary tourists will only be banned from areas above Rongbuk monastery, which is around 5,000m above sea level, according to China's state news agency Xinhua. On Chinese social media, claims have spread in recent days that its base camp will be permanently closed to tourists - but Xinhua cited officials denying that. This year's clean-up efforts will also try to remove the bodies of mountaineers who have died in the so-called death zone above 8,000m, where the air is too thin to sustain life for long.